Blitar fashion: as colourful as the town. There are a number of clothing shops in Blitar. In keeping with the rest of the town the clothing is equally as colourful. Although, I can’t say I’ve seen many women wearing these dresses. Perhaps they are ‘for best’. The men wear quite colourful shirts, and they look good in them too. It’s searingly hot here (it’s November) and I just can’t picture a time when a knitted wooly hat and scarf would be required. Perhaps I need to stay here longer in order to find out. Below is a gallery of some of the items available. I felt terribly dull dressed all in navy! 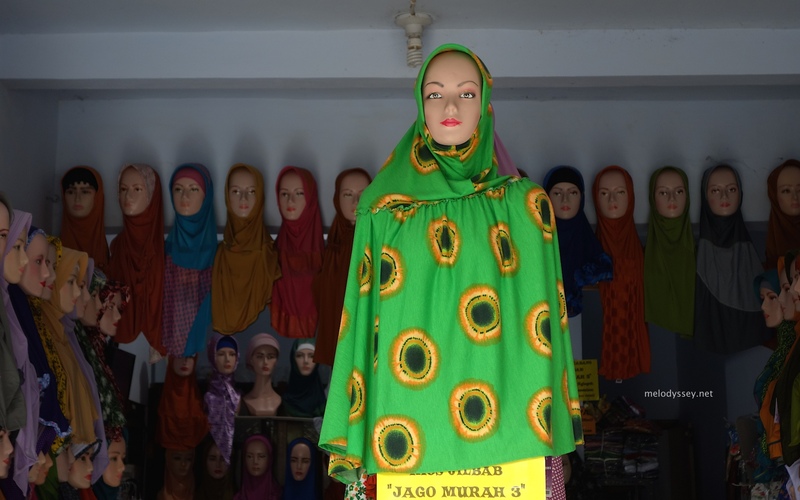 This entry was posted in Blitar, Indonesia and tagged Blitar, Clothing, Clothing shops, colorful dresses, Colourful, Colours, Indonesia, Java, Photos by mellymel2014. Bookmark the permalink.